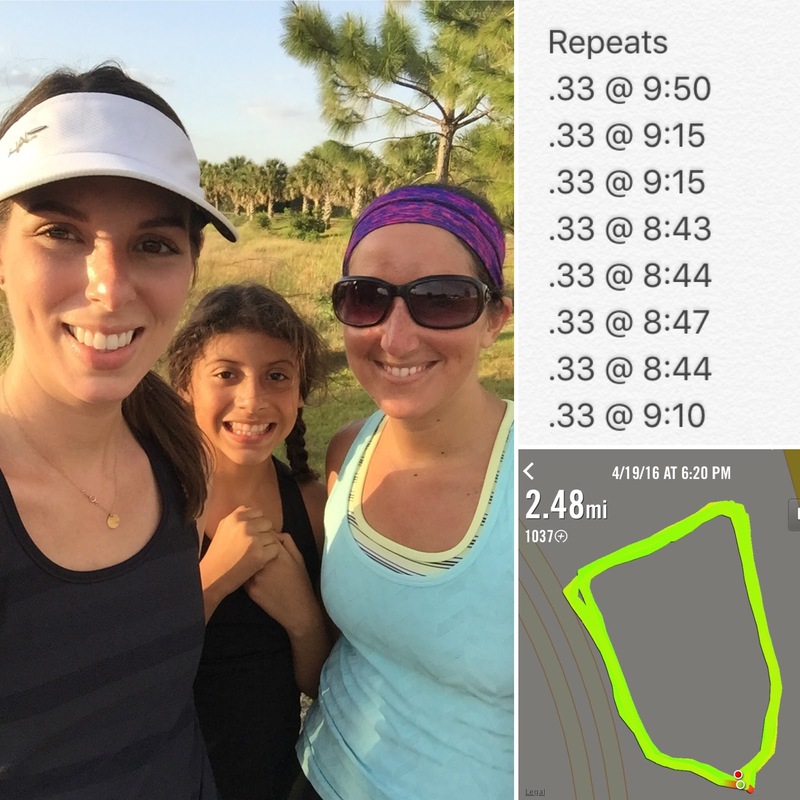 Remember back in January when I decided 2016 would be the year of simplicity, shorter distances, and speed work? Well, I've finally found my groove. It only took four months! To be fair, running the full in February did kind of throw off my original plans, so I'm not feeling bad about finally finding my stride in late April. Monday: Two Nike Training Club workouts for a total of 20 minutes of ab/core work. I was proud of this workout because Monday was a total cluster - it was the day we sold the Prius and had to go to the bank and the DMV directly after school, so I was starving and exhausted when we got home after 6pm - and I had to do my workout without a buddy. Despite the craziness, I got it done! Tuesday: 8 x .33 repeats with upper body during recovery with Elizabeth. Eventually maybe we'll move to a real track and do more traditional mileage for this workout, but the circle is working well for us right now. I did a slightly better job with paces this time around. Wednesday: Game day at the Y courtesy of school (20 minutes of outdoor relay games, 20 minutes of Zumba, and 20 minutes of pilates) followed by T25 legs. OUCH. 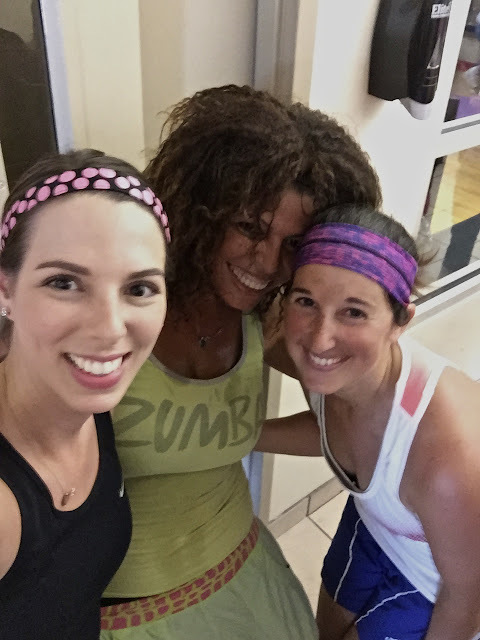 I've never done Zumba before but I totally loved it! I hope to work it into my schedule. Friday: 4.12 miles alone. I pushed the pace and definitely felt it in my inner thighs, which were still sore from Wednesday, and I ended up needing a couple walk breaks. I think I'm acclimating to the warmer temperatures, and I was fatigued because I'm starting my period, but overall this run felt good. I really liked my outfit that day and wanted to capture the entire thing. The Lioness skirt in Free Love is seriously my favorite new piece of running gear ever. It felt nice to push it even though I couldn't hold the pace consistently. I'm enjoying my workouts feeling hard. Saturday: Rest and Passover. I indulged during Seder, as is to be expected, but I didn't even feel a little bad about it. I know that food-guilt isn't healthy and having a day of indulgence after two weeks of balanced eating is totally fine. I was worried I'd feel bad, but I didn't! Sunday: Somehow I managed to roll out of bed and go collect Elizabeth for our first "long" run in awhile. We did six miles at a nice steady pace and I enjoyed pushing the distance again. I'd like to get my Friday runs up to about six miles and my weekend runs around 8-10; I feel like I'm on track to get there pretty soon. My eyeballs look tired because I was beyond exhausted. After our run I went home and napped for two hours! Also, on Sunday around mile 1.5 I needed a bathroom so we stopped by a church that has outdoor access to its bathrooms. The women's room was locked so I used the men's. And I just need to take a moment here to comment on how ridiculous it is that that would be considered illegal in certain places in the States these days. 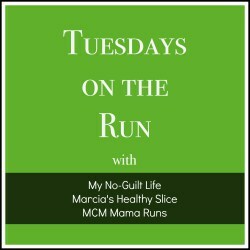 Today I'm linking up with Erika, Marcia, and Patty for TOTR! Great job on your training! Those paces are looking good! Zumba is tons of fun, a local group does it every Monday so I am hoping I am able to make it soon! I like switching things up, helps with my mental fatigue. I used to really hate cross-training, but I'm beginning to find that it does help me stay interested in working out...as long as I find something I actually like doing! Huge kudos for doing your Monday workout after a hard day and coming home hungry. Evening workouts are always so tough for me. Great paces on your interval workout, and cute pic! I'm just starting to add in speedwork, and it feels good! Well, hard, but good! Speed work feels SO hard, but I feel the most accomplished when I'm done than with ANY other workout! Nothing compares. I lover that you used the men's room,I have done that during races. I'm tired just reading about your week! I must live under a rock to not know that using the mens room would be illegal in some places. Holy crap. I am a repeat offender of this. Why wait if there is a perfectly good restroom available? Great job this week! 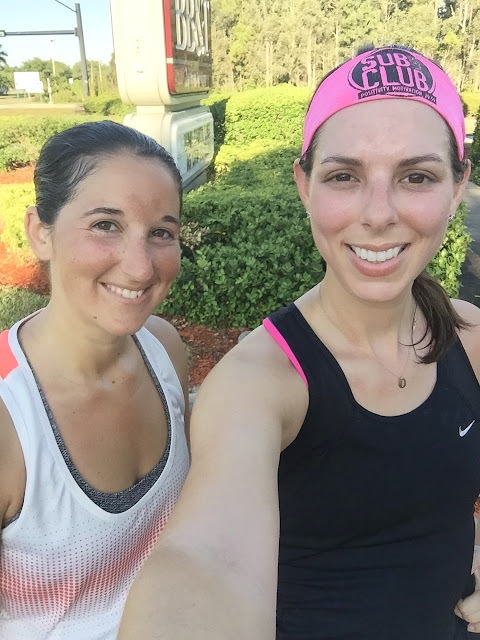 Also loved seeing that you used Nike Training Club - awesome! Best app!!! Oh yeah, if you feel like losing some faith in humanity, look up the latest anti-trans laws and bathroom laws going around the States. I used the men's room at Johns Hopkins once. I had to GO!!! I think you always look beautiful in your post workout pictures. Glad you are finding your groove! Yes those pesky marathons can change things up. ;) You have run 3 marathons!!!!!! I was just saying to Matt the other day OMG I'VE RUN 3 MARATHONS...CAN YOU BELIEVE IT?! I'm really excited to run another eventually at aim to break at 5 hour mark! I'm pretty much the worst when it comes to evening workouts. I make too many excuses & rarely get them done. So props to you! And doesn't finding your groove just feel great!? It definitely helps to work with my accountability partner. I'd feel bad letting her down, and we motivate each other to get it done! Great job on your wk of workouts. I have never taken a Zumba class. I have no rhythm. Cute spring skirt! I'm loving my spring skirts! They make me feel so feisty haha. I totally use the men's room if I gotta go and that one's empty, lol!! I always forget how much I like NTC. I need to use it more often! The other day I was out to lunch with a coworker and used the men's bathroom. It was a single stall bathroom so it wasn't a biggie, but the whole bathroom issue is so crazy! Ah yes, I was just saying this weekend that being child-free makes life SO much easier. The bathroom issue drives me nuts. No one is going to tell me where I can or cannot pee, and I hate that people live in fear of being attacked if they use the "wrong" bathroom. DMV is the worst! Sounds like you had a very solid week & I love lioness -- but only for shorter runs; I've got too much chub rub for it to be comfortable for longer runs. I had a great week last week, this week has not started well, hoping it ends well! I've found some of my lioness skirts fit differently than others, so a couple of them are great for marathons but one of them isn't. So odd! I'm glad your week has started well! Great job on your workouts this week! It sounds like you are getting back into the swing of things after A1A. There is definitely no shame in taking some time off. I think it's good for you to chill out a bit after a big race. Also, your running outfits are super cute! I think the time off has helped me get back into the right mindset for working out and running. Definitely needed! Great week of working out, especially considering you had to squeeze a few of them into a busy day! Glad to hear the speed work is going well. I wish I had a buddy to run with that was closer to my pace (my boyfriend's so fast!). Sometimes it's fun to do repeats with someone much faster because you can meet them at the beginning of each lap during recovery, but run at your own pace during. Great workout week. I like how you mention no guilt with having a day of not so healthy eating. I think it's good to be reminded of that. I try to do that but then I get down on myself sometimes because I'll be doing so good and bam, I have a splurge day. I'm getting better but it's always nice to see others saying No Guilt! I am hyper-aware that when I monitor my eating, sometimes I get too obsessive and start to see food as "good" or "safe" vs. "bad"...I was really proud of myself for not feeling guilty for indulging on a holiday! I'm glad you're getting better about it, too!